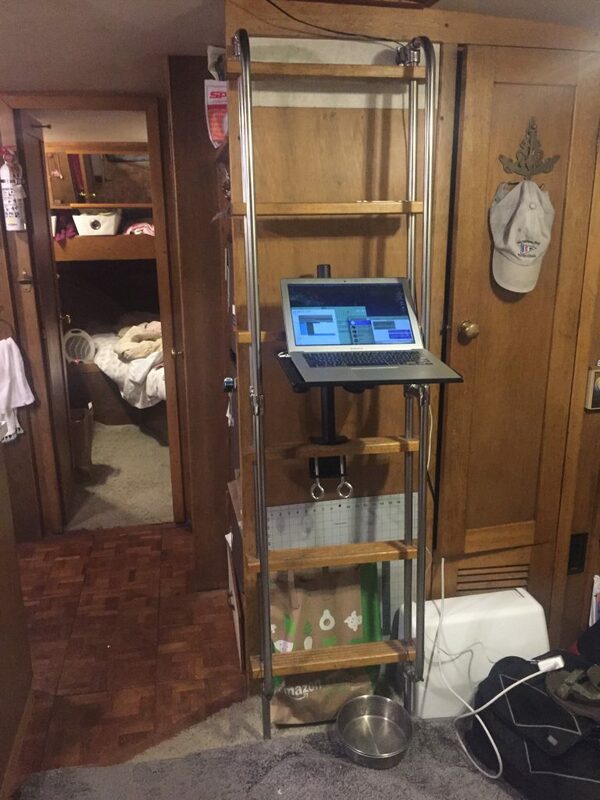 Finally, a standing desk on the boat! I have had standing desks for years. In fact, I recently posted a photo I found of the standing desk I had at our Lake City house. When we moved onto the boat I was bummed that there was no area that was both compact and out of the way enough for a standing desk. A couple weeks ago I accidentally ran across the solution! What I have set up now is a monitor mount with a tray on the arm instead of a monitor. It has been working great! The only major issue I have run across is the monitor height. Because I am using the built in laptop monitor I am looking down, which hurts the upper back after a while. Thinking now about getting a small external monitor to mount similarly above the laptop. Winter is here again, that mean rain and winds. 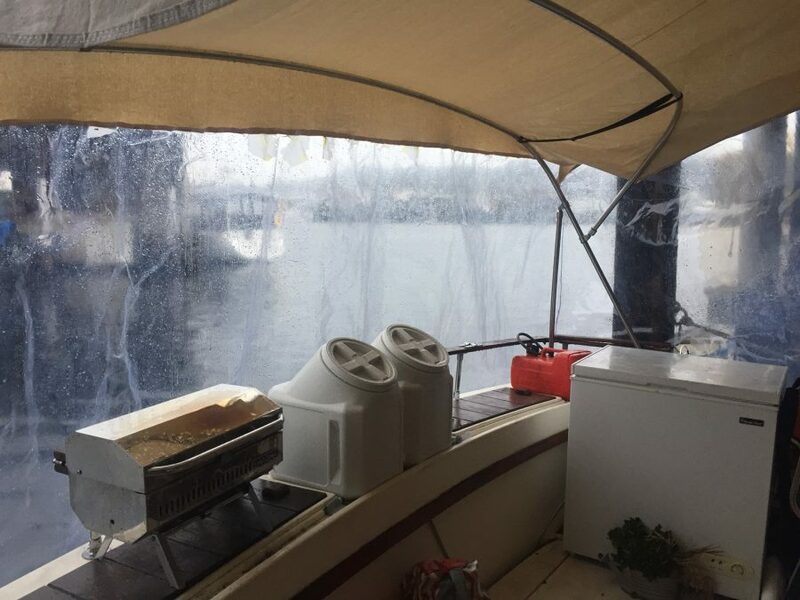 Last year we created a canvas top with velcro sewn into it that kept the back of the boat mostly dry, but did allow the wind to whip through. This year I added port side and rear windows. For 2 reasons: 1) It lets more light in than a solid canvas (duh). 2) The port side is a wind block. Specifically, I changed it this year to have a side wall because during storms the wind comes from the South. 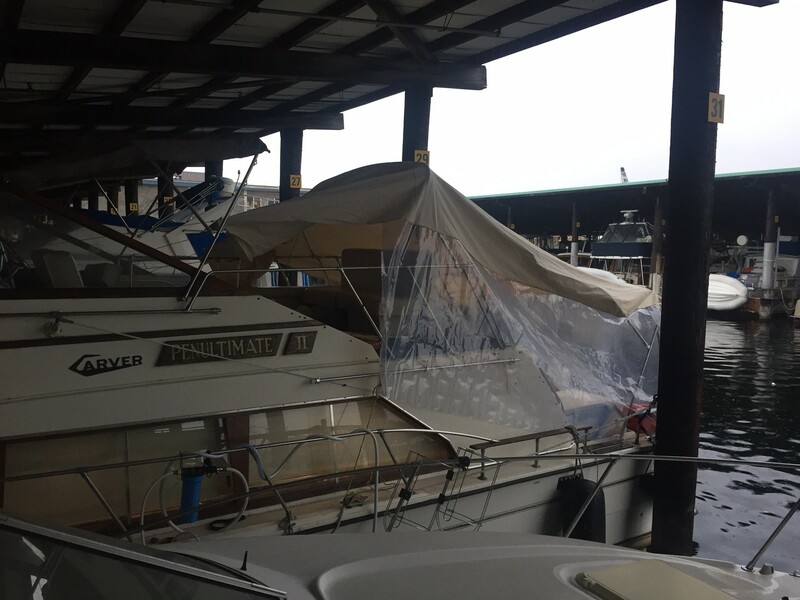 Our rear port side is exposed to the South, meaning the winds hit us directly. 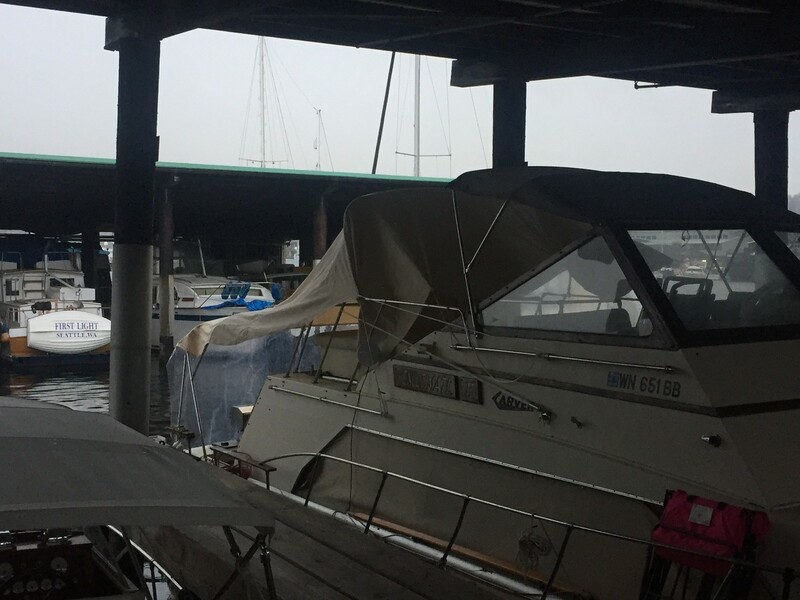 The walls stop the wind and any sideways rain from getting into the boat. So far it has worked perfectly. This top is definitely not elegant in any way. It is essentially a huge tarp with a corner sewn into it. It is nowhere near the elegant canvas work on other boats around me, but it is significantly cheaper than having it professionally made. That said, if we live here again next winter I think we will spring for a professional canvas. It will enclose all 4 sides and the flybridge, which will dramatically increase our dry living space. Penny has an 1100 gallon per hour bilge pump that slowed down to a dribble when it should have pushed out a river. This could be a big problem if the boat were ever to take on water! I took it apart and found a TON of hair inside! I am impressed that it continued to work even a little. Pulled the hair out, reconnected everything, and it is happily pumping away at full power again. The pump is an Attwood Sahara S1100 GPH and I highly recommend it. Since moving onto the boat my wife had been complaining about the water taste. It seemed fine to me but I picked up a Camco EVO water filter to see if it would make her happy. It really improved the water quality! Even I noticed. The Camco EVO water filter is designed as a simple inline water filter, mostly for RVers. Very easy to set up, just drop in the filter, connect a water inlet hose, and connect the outlet hose to the boat. The longest part of the operation was determining where to put the filter. Immediately the water taste significantly improved. The wife is happy with it and I highly recommend the filter. The manufacturer recommends replacing the filter every 3 months of use and we did. It definitely was working. 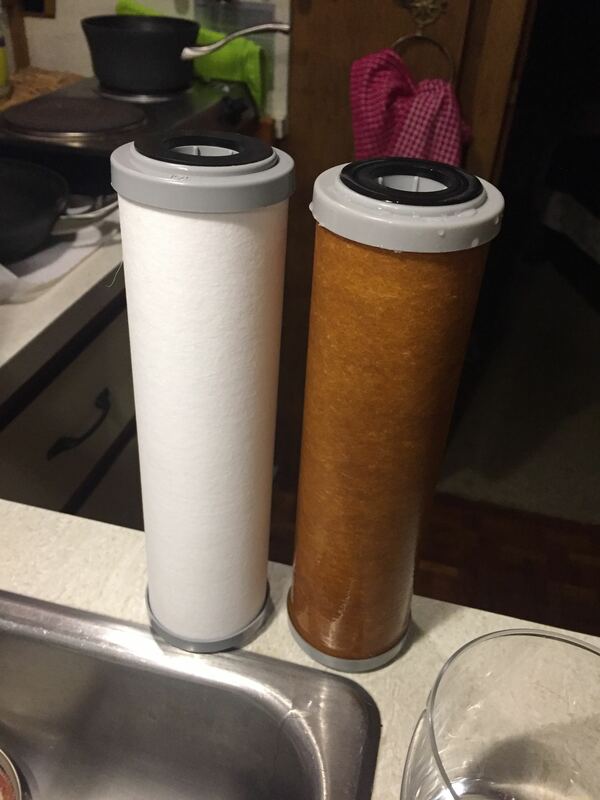 Check out the following photo of the nasty brown used filter compared to the clean new filter. Legalise(ish)….I was not provided this product or asked to review it. Update: We have lived with this toilet two years and still love it. In fact the wife does not ever want another water toilet! 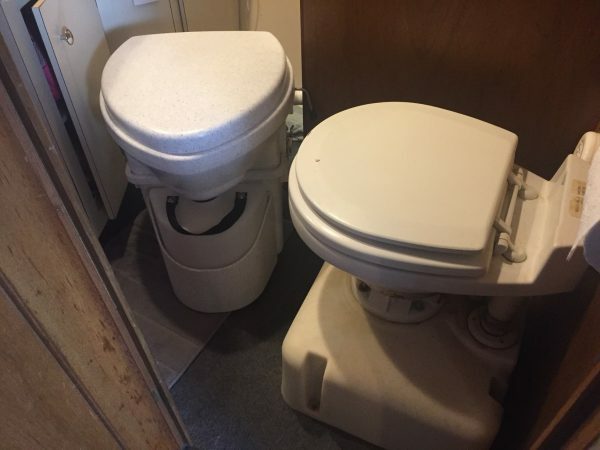 Just about a month ago today my wife and I received our brand new Nature’s Head composting toilet and we could not be happier with our choice. I had looked at them while I was living on the boat before getting married and they looked neat. After getting married and both of us moving onto the boat the existing system just did not cut it. After extensive research we settled on a composting toilet. 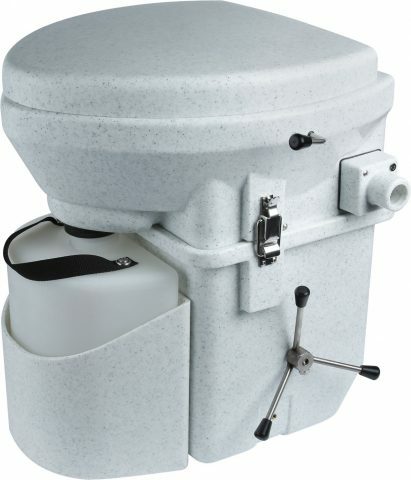 Of all the composting toilets on the market we chose the Nature’s Head for its looks and simplicity. Everywhere I looked I saw people praising the composting toilets, in particular the Nature’s Head, but by and far it was simply praise. I wanted the dirty day to day details. What is it like to install? How is the operation? Will my girly-girl wife like it? What is the up keep? What is it like to empty? Does is really have no smell?? I want to use the blog post to answer some of those day to day questions that I (and some of you have) had. Installing the Nature’s Head composting toilet was a snap. It comes in a large box pre-setup. All you have to do is add the composting material of choice and start using it. There is a ventilation hookup on this head. It is recommended to hook it up however I have not yet hooked mine up. 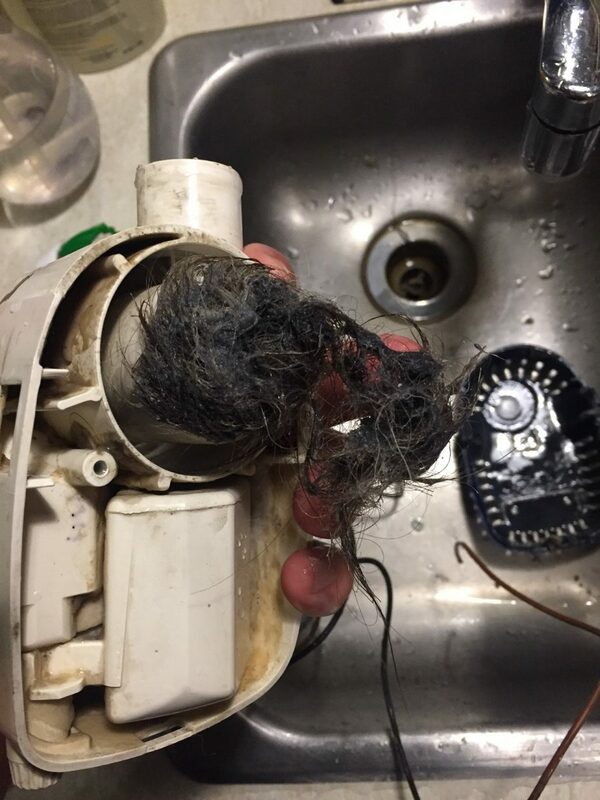 A survey of other composting toilets shows that most of them do not have the ventilation so I figure it is not critical to have it on till I clear out the old hoses from the prior head install. Should you hook it up? Yes. The ventilation in this head is designed in such a manner as to move air through the compost chamber. This helps to dry out the poop faster which will reduce both the smell and bacteria count quicker. Many sites/reviews will tell you that you need it to get rid of the smell but I can tell you that is not the case. Potentially it will smell less, but as you read on you will note that there was never any unpleasant smell. For comparison: Nature’s Head composting toilet on left, standard marine head on the right. Another major plus of this toilet was its size. Some reviews mention that in a negative light, however it was just about the same size as the old head we had. That definitely made the transition smoother. There are many choices for composting materials available: peat moss, coconut fiber, sawdust, some people even collect dry leaves. The key here is that the material be fairly dry and easy to compost. The material needs to be dry because the point of the compost box on this head is to dry out the poop. With two people you would think this box would fill up quickly but the magic happens when the solids and liquids separate. The solids (poop) goes into the composting bin and the liquids elsewhere. When poop dries out it takes up very little space. I emptied our box into a regular kitchen trash bag and it filled less than a quarter of the bag. After looking at the options we chose coconut fiber (or coco coir). The primary reasons we chose coconut fiber are 1) its compactness. The coconut fiber we ordered comes in a dehydrated and compressed block. This makes storage of the unused part easy. It does mean that I have to break it apart and rehydrate it, but spending 20 minutes on that once every month or two is trivial. 2) The other leading material is peat moss. Peat moss is pretty tricky. You have to find the right style of peat moss otherwise you risk introducing additional toxins and/or bugs to your head. Nasty. The big question, what is actual day to day use like? Basically put it is pleasant. When you open the lid on the toilet you will notice two holes, one in the front for liquids and one in the rear for solids. If you are not pooping that compartment stays closed. Liquids will all run into the liquids compartment. If you need to poop flip the handle on the side and the composting compartment opens. Poop, wipe, close the compartment. Easy. There is no water used with the composting toilet. 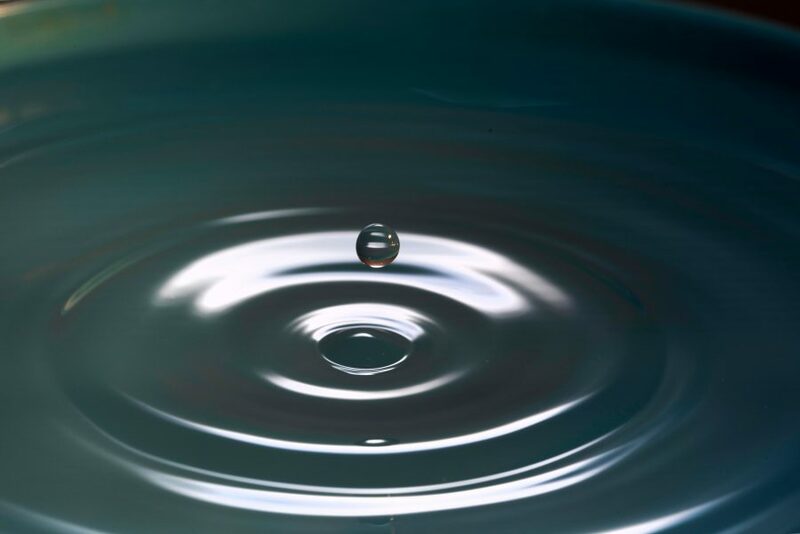 Some stats say that it saves 16,000 gallons per year per person. I do not know how accurate that is but if it is true that is pretty neat. Because you have essentially dirt in the composting compartment when you poop it makes no noise, and there is no backsplash. The first time pooping was interesting, but now I love it. No noise to disturb my wife while she is sleeping! I mentioned earlier that we went a month before I emptied the composting bin, and I am pretty sure I emptied it early. I will talk about that more in a bit, but what about the liquids? I work from home and my wife works/goes to school in the evenings. That puts us at home most of the day, which means our primary toilet is the Nature’s Head. The Nature’s Head has a separate and removable bottle for urine. This we have to empty every two to three days. Quite honestly emptying the urine is far worse than emptying the composting bin. Urine is smelly! When you get a whiff of sewage (urine and poop mixed) you probably think the smell is the poop but it is definitely not! Urine stinks! I nearly gagged the first time I emptied it. Now I know to hold my breath. Emptying the urine is as easy as unsnapping the latches securing the toilet bowl to the bin and picking up the urine bottle. Go dump it somewhere legit and put it back on. Done. Smelly process maybe, but it only takes a couple minutes to do and your nose has relief. When pooping the poop falls straight down into the composting bin and the urine diverter turns into a shelf in front of the compost bin. Pretty clever setup. I have not had any problems with it, though my wife has sometimes had issues with urine going into the composting bin or vice-versa. She is a little lady though. Nature’s Head has recommendations on how to sit to alleviate these issues that seem to work ok. Very! In fact the composting toilet is far more sanitary than the typical marine or household toilet you are familiar with. Why is that you say? Separation of liquids and solids. When poop and urine combine it creates sewage. Sewage is highly unsafe. With a composting toilet that separates liquids and solids no sewage ever forms. Urine itself is typically sterile. Depending on your own health and what the urine comes into contact with on the outside of your bladder it may introduce other pathogens, but overall it is safe. Poop on the other hand does have naughty bacteria in it. It is postulated that your own poop is not unsafe for you since it came out of whatever is already in your body. The reality of the matter though is that the bacteria in your poop will die about six hours after leaving your body…if it is dry. Thus the reason why separating out the urine is so important. Wet poop will cause the bacteria to growth, it can also promote unpleasant odors. You have probably used an outhouse (Porta Potty) somewhere that had bugs flying around in it. That is gross! With the composting toilet there are no bugs! If you do have bugs in your composting toilet it means something is wrong. 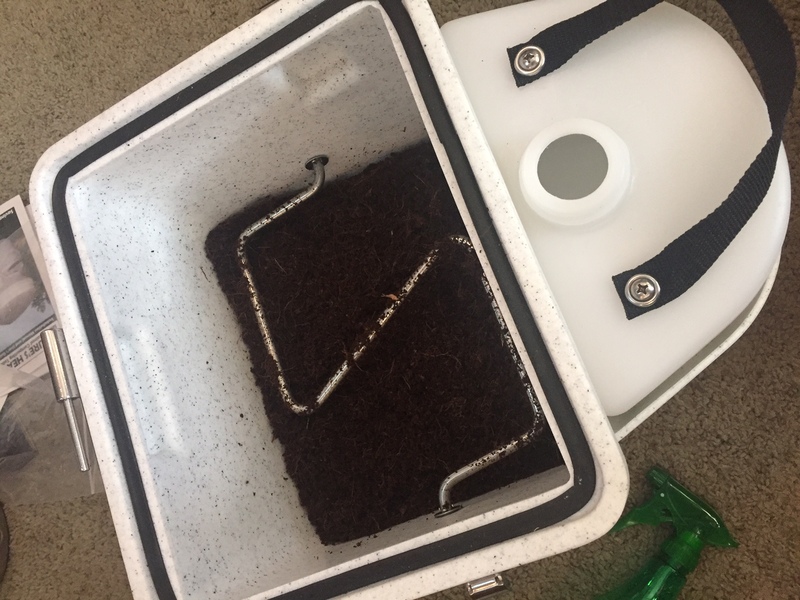 Your compost bin may be too moist or perhaps you are using peat moss. Regardless something is off. Nature’s Head has resources on its site that will help guide you through the process of getting rid of bugs if you get any. The worst thing that can happen in your composting bin is too much moisture. This will cause a smell and eventually lead to sewage. As a newbie to the composting scene you will likely not get the mixture right the first time. This happened to us. I noticed a poop smell and when I popped open the compost bin it looked like clay instead of dirt. Whoops, way too moist in there. This probably happened due to a combination of putting too much water in the coconut fiber initially to hydrate it and getting some urine in the compost bin. Not to worry though, there is an easy fix. Simply add more coconut fiber! I tossed in a few handfuls of still dehydrated coconut fiber and let the moisture in the compost bin rehydrate it. The coconut fiber sucked the excess moisture out of the bin and the next day the levels were back to normal and no more unpleasant smell. What does it actually smell like? All over the net you hear people saying the composting toilets do not smell but you are pooping into a box! How can it not smell? What does it actually smell like? Basically your toilet will have a smell, it will smell like whatever material you use in your composting bin. In our case we use coconut fiber. Coconut fiber has a very earthy smell do it. A couple days ago (nearly a month into using the toilet) my wife walked into the bathroom to #2 and said, “It smells like we are gardening in here”. My wife has a sensitive nose and kept a diffuser running with essential oils nearly all the time with our previous standard marine style head. With the composting toilet we have never needed anything because it really does not smell like sewage. The only smell you should ever get is of the composting material you use. After urinating it is recommended that you squirt a mixture of water and vinegar into the urine area to help keep the urine smell down and the toilet bowl clean. When I created the mixture the first time I used way too much vinegar. This lead to a pretty strong vinegar smell coming from the bowl right when you opened the lid. Easily fixable by lowering the levels of vinegar in the mix. As I mentioned before, the smelly part of your leavings is the urine. When emptying the urine bottle it puts out a pretty bad smell. This is the reason for the vinegar mix in the bowl. The way the urine diverter is setup most of that smell does not filter its way back out to your nostrils. Ah, emptying the Nature’s Head was the part that kept me away from it for so long. With the standard marine head we had a guy who would come and pump out our tank for us. We never had to deal with it. With the composting toilet it is now our responsibility to deal with our own poop and pee. It is really not as bad as it would sound though. Emptying the urine is as easy as pulling the bottle out and dumping it in an appropriate place, be that a regular toilet somewhere (our marina has toilets on land), a pump out station, or other appropriate area. It only takes a couple minutes. The “big job” is emptying the composting bin. This is where the poop goes. Even this is pretty easy though. I use regular 13 gallon trash bags from Fred Meyer. These trash bags fit perfectly around the opening for the compost bin. Simply snug up the bag and flip the entire unit upside down (be sure the urine bottle has been removed first!). Because everything in the composting bin should be dry it will fall out pretty well. There may be some left clinging to the walls or the agitator but it will be minimal. It is fine to leave this as it helps promote composting faster in the new material. Emptying the composting bin also only takes a few minutes. It is a much more pleasant job than emptying the urine. The longest part of the whole emptying procedure is actually rehydrating the coconut fiber. I have to break up the dehydrated coconut fibers and add water to it. It takes 20-30 minutes for this part. I may try to find non-dehydrated coconut fiber next time. It takes more storage space but also helps come emptying time, especially in the limited space on the boat. After a month of use and one full emptying cycle I have to highly recommend a composting toilet, in particular the Nature’s Head composting toilet. For casual use such as a boat or cabin you could go half a year or more before needing to empty the compost bin. It saves a ton on water and is simply awesome. Even as a full time user with two people I highly recommend this unit. You will not be disappointed. If you are putting it on a boat make sure that you check vertical clearances as this unit is tall. The number one recommendation for this toilet has to come from my wife though. She is a girly girl and likes her luxuries. She loves the composting toilet. Over the Thanksgiving holiday we visited my parents and binged on the tv show Tiny House Hunters. It surprised both of us how many of them have standard toilets and holding tank systems. That means they have to be tied to a sewage grid somehow. On the episode that had composting toilets and the buyer was against them my wife actually yelled at the tv about the people being stupid to not want a composting toilet. There is your number one recommendation :). I was not paid or given anything to write this review, though I would have been happy to have received a free head for it! These are opinions of my wife and myself only.